The US Navy dropt bombs on their target range this past weekend. 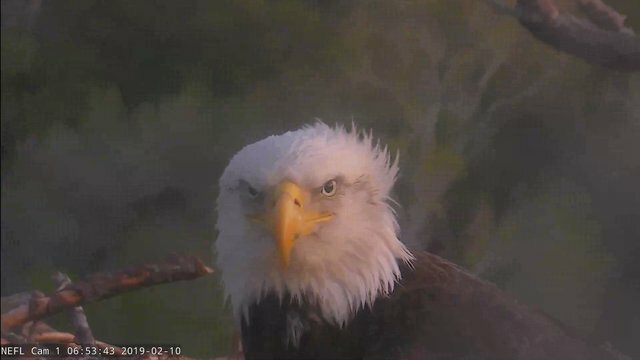 That noise and activity may have annoyed our eagles. 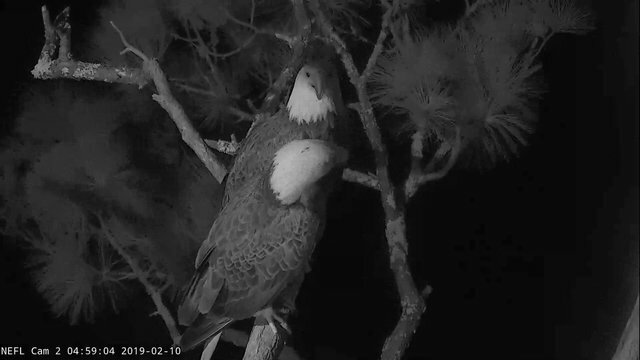 When I 1st came in they were still asleep and perched so close together on the branch!! Such a shock to see after sleeping arrangements of last several nights. Really hoping for a commitment here!! Awake and preening when I left. © American Eagle Foundation, EAGLES.ORG. jd_AEF (Moderator): 5:00 am Samson moves into the nest...he's ready to do some nestorations. A2 looks like she's thinking about joining him. He casts a pellet. Thanks loza and Ferenz for pics of Samson and A2 this morning!! Samson leaves as she remains in the nest. Ferenz, beautiful captures of A2. Samson had been in the nest with her prior to his leave. Wonder why she didn't follow him? She continues to call out. Is she waiting for a hopeful fish delivery from Samson as a test of his bond to her? 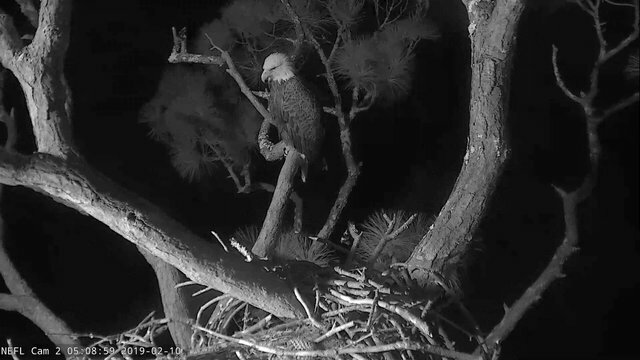 A2 is currently in the nest. Samson has been in and out all morning. leigh_AEF (Moderator): Samson returns at 7:47. He is perched on the Wallenda branches. suncats_AEF (Moderator): Good Morning! Samson briefly hopped down to the nest, then over to Sunset Branch around 9:15 am. suncats_AEF (Moderator): Samson flew at 9:38 am hopefully he and A2 will be back soon! suncats_AEF (Moderator): 9:53 am. 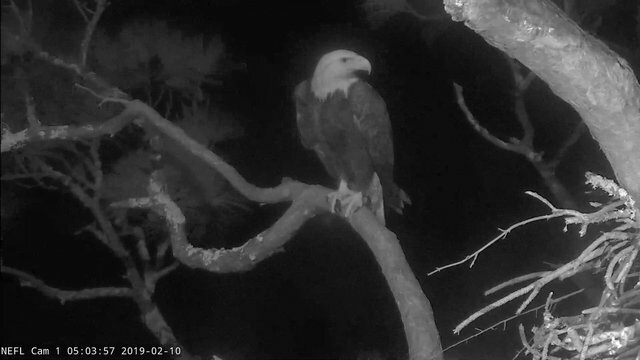 Samson returns to the nest with a headless fish. Takes after his dad! After eating the fish, Samson hops up to Lookout Point feaking and cleaning after his meal. suncats_AEF (Moderator): 10:08 am A2 returns to the nest, and Samson joins her in moving sticks around the nest. Sucn a beautiful sight to behold! 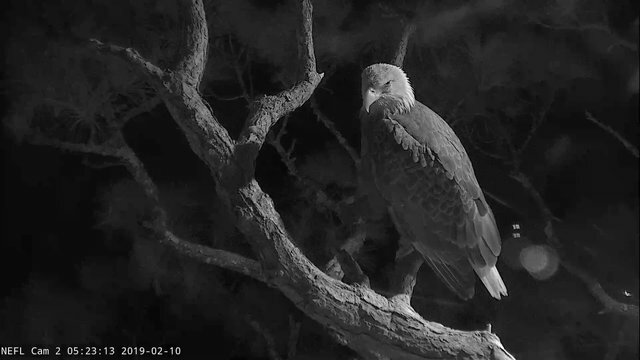 suncats_AEF (Moderator): Samson moves to Sunset Branch while A2 remains in the nest. At 10:21 am, Samson returns to the nest and both eagles arrange sticks around the nest. suncats_AEF (Moderator): 10:57 am Samson was quite vocal as he hopped to the nest and then flew away. 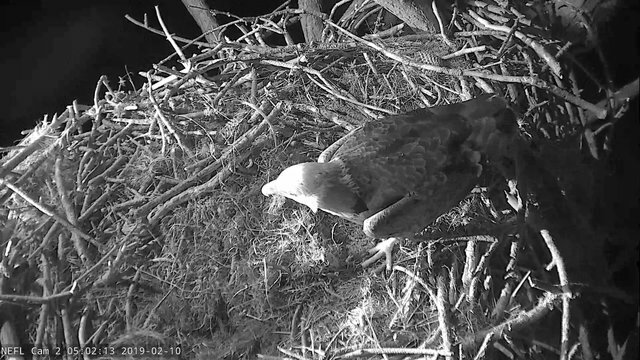 Not sure why, as A2 remains on the nest. 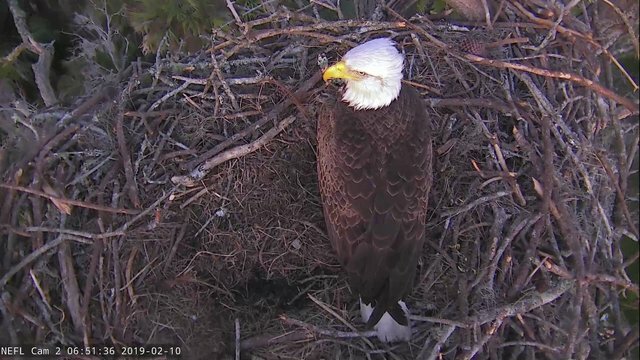 I noticed he did bring a "headless fish" to the nest @ 9:53 AM, wonder if he would have given it as a gift to A2 if she had been there? I mean why not just eat the whole thing where you were Samson? A2 just arrived without any vocals. She joined Samson who was already in the nest. It was a jolt to see her suddenly appear without so much as a peep!! Surprisingly, she just flew off and Samson followed her. You could hear their voices in the near distance for awhile. Shep, this is for you ... maybe there is hope for A2! Excerpt from descriptive comment per author under video: "An interesting thing in this clip is the adult-sounding vocals from A2, who has typically had very loud and immature vocals". Shep, I really hope he keeps his home too!! And A2!! 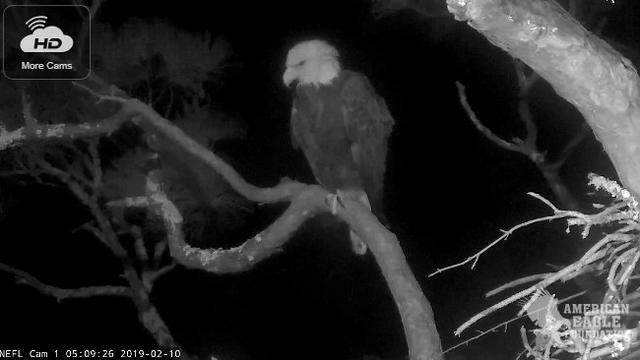 The mods think it is Samson who flew back to the tree alone last eve in the rain and who remains there now perched on the sleeping branches. It's so rainy, you can't see ID marks. Thought this excerpt I pulled from "Tuck-In" report was neat! 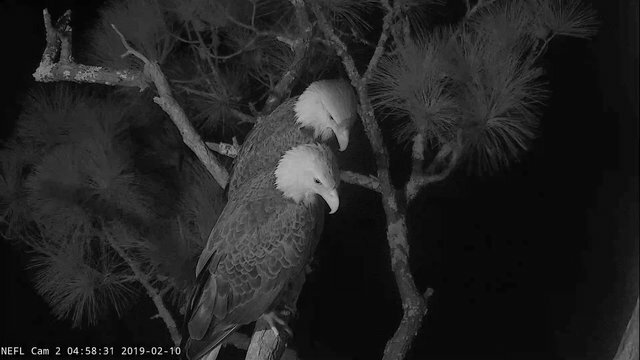 "Residents saw Samson perched at the Sleeping Tree (ST) prior to arriving at the nest this afternoon. They also indicated he caught a fish in the ST pond!" The eagle just flew and I am unsure who it was! You can hear an eagle in the near distance. It is soooooo foggy now! 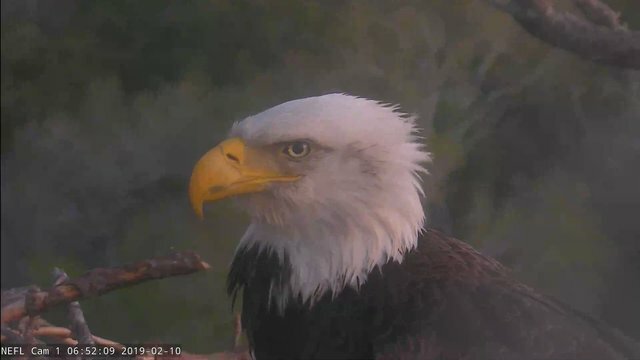 Mod reports A2 and Samson dropped by early this morning to dry and preen. Also, while not seen they are hearing A2 in the distance sometimes. Excerpt from aka AEF MOD comments: At 2:00 Samson arrives with what appears to be a catfish. He appears to be waiting before finishing the fish. Maybe he wants to share with A2? After waiting two minutes, he continues to eat the catfish. He leaves a few bites, then flies to the Wallenda Branches then to Lookout Point. Samson flies from the nest tree at 2:45.